Remember, I didn’t make up these Insights. I argue that the Insights are universal and are finally becoming understood as humanity wakes up to its authentic spiritual Connection. By looking at the Big Picture we can slow down enough to see that this experience is waiting for us, that we can enlarge our Spiritual consciousness, see how we are guided intuitively, and become aware that we have help in this world. Help that is coming to us through a continuous flow of intuitions and mysterious coincidences — Synchronicity — that can take us to our true inspiration and the discovery of our soul’s mission. Again, I’m speaking about tuning-in and waking up to what life is really all about and personally aligning with the way life is designed to be lived — if you want to have the most energy and fun. This is the life that humanity is now discovering one person at a time. All we have to do is prove to ourselves that it is real. Acknowledge what every generation senses, that there is something missing in how life is usually lived. 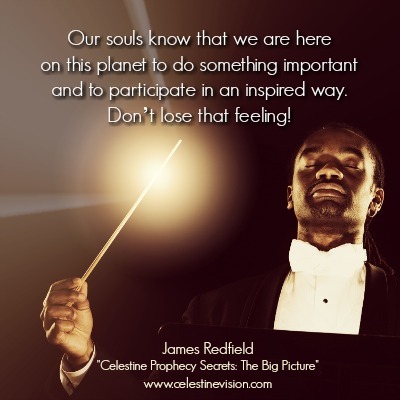 Our souls know that we are here on this planet to do something important and inspiring, to participate in an inspired way. Don’t lose that feeling — no matter what people say! Make time to meditate or pray silently daily. Practice letting go of the inner chatter of emotions, complaints, and regrets that echo in your mind. Instead, seek to connect with a Divine Love that lives within you — as you practice visiting this place, it enlarges, becoming easier to find, and gradually you enable yourself to reside there more and more in your daily life. Over time, you realize this place fuels your peace, your centeredness, and utlimately facilitates a very mysterious knowing which guides you via love based thoughts that just ‘arrive’ in your mind. You are now downloading your intuitive intelligence. And the only effort needed is for you to meditate for 20 minutes a day. Pay attention to the thoughts that are not reactions, but rather those that urge you to do something that feels inspiring, and helps yourself and others in some way. This is your guiding intuition, and you can learn to let it primarily steer your life. Intuitions always urge you to act in some way — often to help someone, or to seeking information that will prepare you for something later. Always act on an intuition as quickly as possible, but use logic to implement the ideas. Sometimes you are guided to pursue a course that will take some time to unfold. So don’t bet the house on a new plan. Let it unfold gradually and strategically. Don’t follow thoughts that are negative to others or act in a way that is not in another’s best interest. Doing otherwise will stall and corrupt your dream over time, and believe me, money doesn’t make up for the loss of inspiration. You can prove to yourself that the universe has a Karmic design. What you sow is clearly what you reap. Here’s how it works: Manipulate others for your own gain, and you will draw the same kinds of people as you (Controllers) into your life — stopping your flow and giving you a rough wake-up call. Act only to be helpful to others and you will attract the same kind of people (Helpers) onto your path, showing up just at the right time to help you. Life becomes easier. Once we begin to follow our strategic intuition, we enter the flow we are designed to have in life. An intuition suggests an act, say to call an old friend or to visit a client. And when we act logically and find time to do this, often we hear something from another that helps move our goals or dreams closer. Again, when we follow our intuition to help, others show up to provide mysterious opportunities for us. A flow of Synchronicity begins. Often, this flow of mysterious happenings seems so unlikely that it feels as if we are on a miraculous road of destiny, and that a larger, divine hand is leading us forward. Again, this is how life is designed to be. Keep a journal of your spiritual journey — the flow is designed to prepare us for ever more meaningful ways to help others, and thus to help the world become more conscious. But what if this flow suddenly stops, almost like hitting a brick wall. This occurs with everyone. Because we live in a world that is still too self-centered and cynical, we can get lured into giving up on the miracle life, thinking that all of it was just a delusion. Use this reboot: Find a silver lining in the so-called negative event that stopped you. Even if it’s the worst situation imaginable. See it as a possible tough but positive Synchronicity. Then listen to your intuition, and share the truth of what you are dealing with. Often when we experience a perceived set-back, it’s really just an uncomfortable Synchronicity to make us stronger — and again, part of our preparation. When you find that silver lining, you’ll soon be back in the flow. Realize that when you get in a flow of destiny, of helping others in the world, you are helping the world to evolve. The world may seem to be falling apart, but in reality, it is only separating into two dimensions: the light and the dark. And believe me, most people are seeking the light. The conflict you see out there is just an argument between controllers (people who demand that others act in the way they want). Force doesn’t ever work — although it may be necessary only for physical survival in the short term — hostility is an inherently corrupting practice because anything you fight gets bigger as people are forced to choose sides. Worse, when we fight others it’s easy to unconsciously slip over into the dark side ourselves. It’s much better to just influence others by example, by living a smarter, more conscious life out loud and inspiring others with a contagion of helpfulness. When enough of us do this, then the hostility of the controllers begins to fade away, eventually disappearing altogether, and gradually the controlling world is replaced by a more Spiritually Connected dimension — The Rapture. Believe me when people see the flow, they know nothing else can compare. Our job is to stay focused on our intuitively led mission, but understanding that it is unfolding within a greater story. The overreaching design is that if we strive to be true to our Spiritual Intelligence, some version of our higher dream (which may be different to the first vision we imagined) will manifest. And remember, everyone — and I mean everyone — who attains their dream always seems to come from nowhere, but it’s usually after some so-called failures. Privilege doesn’t make it happen. Money doesn’t make it happen. Only heart does. So stay focused on the BIG PICTURE! TO BE KEPT INFORMED OF OUR LATEST CELESTINE INITIATIVES, SUBSCRIBE TO OUR NEWSLETTER.